Kentucky Boxer Rescue View other Boxers for adoption. PETEY was found wandering and obviously starving. He made friends with a greyhound who's family fed him until they could get him to a rescue. PETEY's a very sweet dog and obviously very food motivated. We believe he's a Boxer/American Bulldog mix, but don't know where he got his speckled back. He likes to play with older kids and is very attentive to his humans. 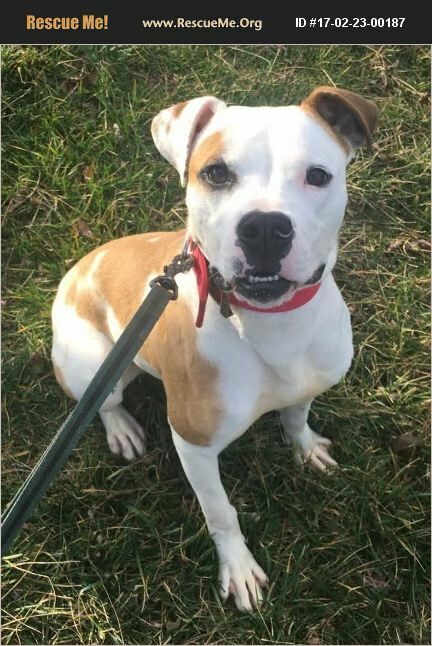 PETEY is energetic and playful. He'd prefer a good game of tug-o-war instead of a long walk! PETEY needs a family that has experience with bully breeds. He is very smart and responds well to a confident voice. PETEY is housebroken has been neutered, microchipped and is up to date on vaccinations. If you're interested in meeting Petey, you can email nomoredirtnapsrescue@gmail.com. His adoption fee is $200.